What is a kitsune? In Japanese folklore, it is a fox that shape-shifts into human form and causes all kinds of mischief. I felt like a kitsune story was a must for this anthology, so was very excited when Heather Jensen told me that’s what she wanted to write about. 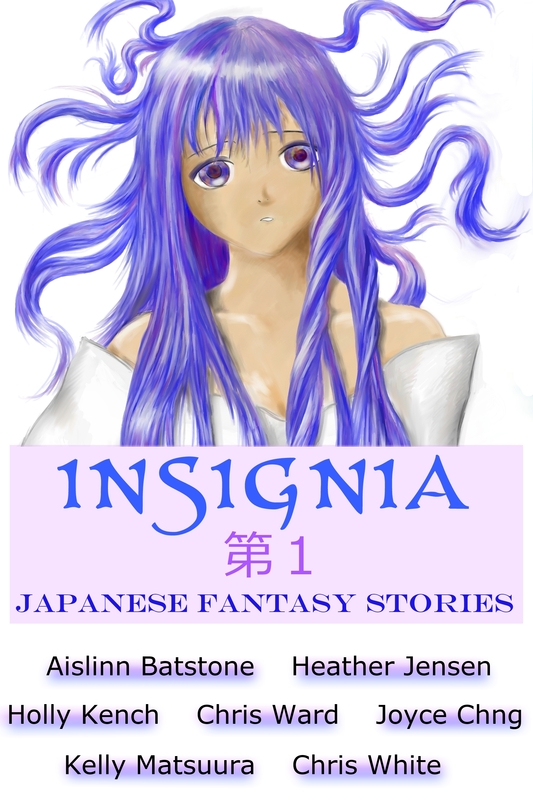 Her story, simply titled Kitsune, is first up in the Insignia anthology and is a great introduction to the other varied stories. Akio carried the tiny mouse in his hands as he hurried home. It seemed to be dehydrated; listless and weak, it had barely moved when he approached to pick it up. A movement caught Akio’s eye and he glanced up in time to see a shadow disappear between two trees. The shadow emerged from the trees, revealing a tall thin figure, dark hair and pale skin barely showing beneath the scarf wrapped around her face. She pulled out her flask and allowed a few drops to fall into Akio’s outstretched palm. “Chiaki.” The young woman pulled the scarf away from her face and peered down at the little mouse. It shivered as it drank from Akio’s hand, and she pulled a handkerchief from her pocket, folded it in two and placed it over the poor little creature. “Do you often save the lives of small things?” Chiaki asked. Akio laughed. “Only when the opportunity comes my way,” he said. “After all, if the larger creatures of the world cannot take care of the smaller, what use are we?” His thoughts turned to Sachiko, a lump forming in his throat as sorrow threatened to overwhelm him. “Are you alright?” Chiaki noticed. Akio began to nod his head then stopped. Akio looked at Chiaki. He did want to talk about it. He wanted to talk of Sachiko’s laugh, of the smile that lit up her eyes, and the gentle kiss she’d placed on his cheek the day before she’d died. But how did you tell someone you’d fallen in love with a creature from a folktale? He shook his head, not trusting his voice. Akio had to stop himself from shaking his head again. Chiaki couldn’t possibly understand! There was so much that was wrong. The guilt he felt, that he’d been meeting Sachiko in the woods when he was supposed to be helping his father on the farm. And then yesterday he’d stayed behind to help his father when he should have been meeting Sachiko. There’d been a fox amongst his father’s chickens again. It hadn’t harmed the chickens, but it had stolen most of the eggs, and Father needed Akio’s help to prevent it happening in the future. Sachiko must have come to the farm to look for him. She’d never done that before, it had been an unspoken agreement that they did not seek out the truth of each others lives. It made their meeting in the forest something special, sacred. He didn’t know why she’d come this time. Akio hadn’t seen her, but his father must have. He pushed the thought away. When Akio had finally found Sachiko, curled up under the great tree, he thought she was napping. And then he’d got closer and seen the bushy red tail and the soft pointed ears. When he’d pulled on her shoulder she’d rolled back onto his lap and he’d gasped in horror as he saw her face, Sachiko’s beautiful face, with a pointed snout and a wet black nose in the centre of it. She was kitsune, a fox spirit, messenger of the Great Spirit Inari. Heather Jensen studied the Japanese language for 8 years, through high school, college, and university, taking up the opportunity to visit the country on a two-week jam-packed school trip where she managed to squeeze in sights as varied as the Temples of Kyoto, ’Jigoku’ (Hell’s) Hot Springs in Beppu and Tokyo Disneyland. Though her preferred genres are fantasy and historical fiction, Heather writes stories in a wide variety of genres: romance, YA, and contemporary to name a few. Her stories have been published in many different places around the web, including 1000words.org, and Five Stop Story, a UK writing competition where two of her stories received Honorary Mentions. Her story Saviour was short-listed in the Ink Tears 2012 Flash Fiction competition.